117” wide x 82” deep x 101” high. 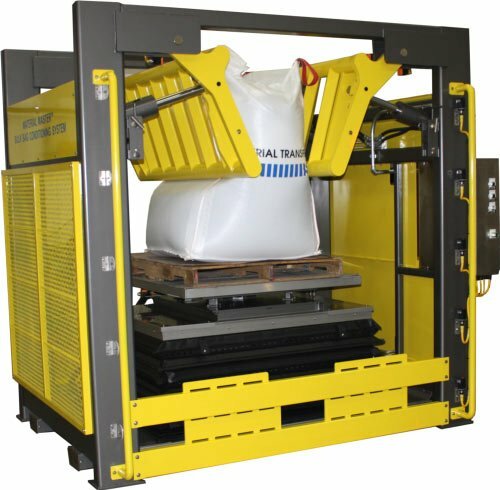 Powered rotary-lift table with 36” of travel and 4,000# capacity allows complete conditioning of a wide range of bag sizes. A lift table front guard for protection from forklift damage is included. Machine features perforated metal guards on three (3) sides with five (5) photo-electric sensors on the load side for operator safety. Unit features a mechanical safety lock-out of pivot rams during maintenance or cleaning of unit. Forklift moveable design allows for easy machine transport and installation. Hydraulic system includes a Parker 1500 psi unit with dual pumps and a 5 HP motor.